Part of the fallout from the Elizabeth Warren-Donald Trump tweet feud is the reintroduction of Warrenâ€™s contested claims of Native American ancestry. Without getting into the details of Warrenâ€™s claim, with which I am unfamiliar, this provides an opportunity to discuss how such claims are established (at least with respect to five tribes). The National Archives maintains a website for researching Native American heritage with various historical documents. In this post, Iâ€™ll focus on the â€œFive Civilized Tribes in Indian Territoryâ€ (Cherokee, Creek, Choctaw, Chickasaw and Seminole) listed on the Indian census known as the Dawes Rolls (1898-1914). The â€œFive Civilized Tribesâ€ are the tribes that were forcibly resettled into Oklahoma (many on the Trail of Tears); being listed on the Dawes Rolls was proof of tribal membership and entitled one to an allotment of land. Of course, even these historic rolls depended on accurate recordkeeping and accurate initial assessment, which was difficult given the circumstances. Careful recordkeeping was but one casualty of the genocide of Native American people. The Dawes Rolls (and similar materials) now matter for those seeking to establish a claim of tribal membership. The Archives has a helpful tutorial that shows users how to track their ancestors using the example of a man named Napoleon Ainsworth, a member of the Choctaw tribe. As it happens, Napoleon Ainsworth was my grandmotherâ€™s grandfather. I grew up hearing about my native ancestry and about Napoleon Ainsworth in particular: how he served on the Tribal Council, how he studied law at UVA. I had no doubts about this ancestry: I knew I was related to my grandmother and knew that she was a descendant of her grandfather. This was, of course, just a part of my ancestry, but I know more about this great-great grandfather than any of my other great-great grandparents. Iâ€™d also like to carve out some space in the discussion between all or nothingâ€”for â€œsomeâ€ identity. It might be a small part of who I am, but itâ€™s a part of me nevertheless. Even as I knew this, I didnâ€™t have any official relationship with the Choctaws. It didnâ€™t seem to matter: my mom and my aunt were both official members, which is appropriate given the Choctawsâ€™ matrilineal tradition. Eventually, though, I wanted my own membership, but given the potent cocktail of both familial and governmental bureaucracy, it took time to send in the paperwork necessary to become a member of the Choctaw nationâ€”until 2014, actually. (Good things come to those who wait and ask repeatedly for several years.) And this is what I want to talk about: what proof looks like, and how strange it feels. A new form of identity? This is a photo of my Certificate of Degree of Indian Blood (CDIB) from the Bureau of Indian Affairs. 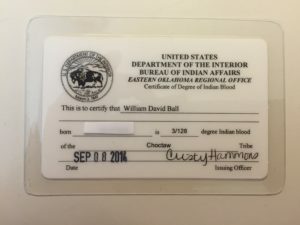 Once my paperwork was processed, I received it along with some other materials, including my membership card in the Choctaw nation and an official CDIB number that is now part of a federal database of those with documentation of native ancestry. When I got these materials, I was pushed and pulled. It was bizarre to receive notification of native ancestry from a federal bureaucracy, a notice that I was officially a â€œblood Indian.â€ It seemed the antithesis of sovereignty, the big brother government telling me about an antecedent culture. Or maybe the CDIB number makes me more like a specimen in a collection, subject to population management. In any event, I now had the official paperwork that allows me to participate in tribal governance. But the notion that native identityâ€”like any other kind of racial or ethnic identity (or, frankly, many other kinds of identity)â€”is somehow fixed or simple or resolvable in a series of tweets and countertweets is absurd. After hundreds of years of contact, removal, intermarriage, smallpox blankets, cooperation, and betrayal, there are no easy answers, just difficult questions.Â Â Iâ€™m not a pure anything. Lots of people with â€œIndian bloodâ€ have other kinds of bloodâ€”so did my ancestor on the Dawes Roll, Napoleon Ainsworth. Itâ€™s not absurd to think that Elizabeth Warren has some Native American bloodâ€”and again, Iâ€™m not saying she does, nor am I denying that native cultures and claims of authenticity have been appropriated well before this (itâ€™s why I will never go to a Flaming Lips concert again). But, in some ways, the way in which she has been attacked, being called Pocahontas (or Fauxcahontas) implies that there is some native identity trapped in amber, that authenticity is necessarily premodern (even though I get my Choctaw news via Facebook), that â€œrealâ€ Indians look like the Indian who cried during those 1970â€™s litter commercials (even though he was entirely of Italian descent). What Iâ€™d like to suggest is that concrete answers are hard to come by, given the intentional campaign to destroy Native American identity and culture. You canâ€™t burn the house down and then complain about how fragmentary the evidence of the original structure is–or denigrate the inauthenticity of what gets rebuilt. And even if we did have concrete answers, they wouldnâ€™t necessarily be satisfying. The concept of â€œrealâ€ race and its relationship to blood is a recurring obsession in American political culture (think of the â€œone dropâ€ rule destroying whiteness). In the case of native ancestry, whatâ€™s different is that blood is whatâ€™s measured, and the federal government issues you a racial identity card that tells you how much blood you have (perhaps pushing the question to how much is enough, or whether identity might have at least as much to do with community and culture as blood). For me, my own CDIB card was just part of my ongoing process of identity. It didnâ€™t give me information I didnâ€™t already haveâ€”it simply gave the BIA information it didnâ€™t have about me. I already knew Napoleon Ainsworth was a Choctaw, and that he was my great-great grandfather. Very thoughtful essay – thanks David. What he said. Me too. How does it work though? Does the government assume that the person on the list was 100% NA blood, and then mathematically figure it down from there until they get to you? Or is it just that, you have "enough" so they declare you on that side of the line? (I couldn't read the card very well.) It's pretty interesting actually. And now don't those child welfare laws apply to you? Are you sure this is without all other consequences? Maybe it's not just a card. Imo, the only "mistake" Warren may have made was in expecting your average American to have any decent idea about how to think about this. What's happened to her is completely unfair but no surprise to any reasonably observant person of color. Mainstream people always think they get to name the others, like they're Adam and Eve and everyone else is the animals. And that my friends is imo a clear marker of ethnicity itself. I don't know, my reading of the matter suggests the mistake Warren made was thinking that nobody would actually notice or check into it. Not being on a government list, or not having proof of x, y, z doesn't mean diddly to me. I take people at face value until they give me a reason not to. YMMV. I tend to assume that being a politician qualifies as reason not to believe them. It's all the same to me, I just recall that it was looked into, and confirmed that the claim was false. I'm not even sure how her claim could be confirmed as false. She's never claimed that she is officially Cherokee. She's never claimed that she had an ancestor on the Dawes list, or any of the other enrollment lists. All she has ever claimed is that, within her family, it is believed that one of her ancestors was Cherokee, and that the family considers themselves part Native American. Her claim is essentially unfalsifiable. In part, that's because of lousy record keeping, exacerbated, as David points out in the post, by deliberate attempts by those in power to ensure that the record keeping was lousy. But it's also because Warren's claim isn't false even if that ancestor was not Native American; we are all at the mercy of the stories that our families tell about themselves, and you'd need to show that her family didn't believe what she has claimed they did to show that she has lied. Please don't dive down the Po-Mo rabbit hole. If she doesn't have a native American ancestor, the claim IS false. It might not be a lie, if she actually believes it, but the claim has a truth value apart from what's in her head. It's not a statement about something subjective, like what flavor of ice cream is best. And, actually, she did make the claim. And, its falsity has been extensively documented. She just stopped making it at some point. Perhaps she realized it was wrong, perhaps she just realized she couldn't prove it, maybe she thought it was hurting her more than it helped. I don't know. But she darned well made the claim. I don't really think that her ancestry is important. That she apparently lied about it to gain benefits, that's somewhat important. That the left has come together to deny reality about it, very important. There ARE objective facts in the universe, and they need to be acknowledged even when they don't say what you want. Even when they reveal somebody you like is a fabulist. A gentle word of caution, if I may: "Po-Mo" or Post Modernism is actually a technical term and should be used only with knowledge and caution, rather as the term "Laplace Transform" should not be used of young Pierre-Simon's decision to change his course of study, and thus transform himself from theologian to mathematician. Now, to the point. There are indeed objective facts–the value of pi comes to mind. And, as J. Michael Neal points out, family stories are often not among them. I can, without thinking very hard, come up with three cases in my own family where what we thought we knew as absolute fact (including some material from unrelated sources) turned out to be either actually or possibly spurious, including one case of misidentification as Native American (the person's father, a transplanted Englishman, missed the nuances of American racial distinctions). But it's also true (research shows) that, when asked to define "lie," people tend to exclude most honest mistakes. Unless of course they want for other reasons to make the "offender" seem more in the wrong than is necessarily justified. There are many reasons one might find fault with Warren's political positions. That she made a mistake about her family tree isn't among them. Like you, I don't really care much about this. However, I looked briefly at your sources and I'm not that impressed. "Polly's Granddaugher"… whoever that is … just says there is no documented evidence of such-and-such ancestry. We already knew that. So what? As for the employment stuff, to me if someone makes a sincere mistake… and I use the word "mistake" ***only*** in regard to this legalese business of whether or not you have a communally respected identity as an X, Y or Z … then that's all it is. That "Elizabeth Warren wiki," deliberately designed to look like wikipedia, reeks of objectivity. One of the greatest controversies surrounding Elizabeth Warren is her claim to be Native American, specifically Cherokee and/or Delaware. The issue of whether Warren falsely claimed to be Native American was raised during her campaign for United States Senate in 2012, and is an important part of her public political persona because of evidence that the claim was unfounded. Great controversy? Important part of her public persona? You know, I live here in MA, and I can assure you that her constituents, if they think about this at all, which few do, regard the "controversy" as a steaming pile of right-wing BS. Once again, your standards of "proof" are remarkably loose for things you want to believe. There's a lot of rounding error–as usually goes on with a blog post. I'm not a resident, and the whole issue tribal sovereignty is one that, as a lawyer, I know enough to know how little I know about it. One of the things that I did not do a very good job with is situating this in the larger context of the way whiteness serves as a kind of default. As my wife said to me this morning, this is the unusual example where being categorized by the government as not entirely white did not have negative consequences. I wasn't redlined from receiving loans. It didn't mean that my immigration status or citizenship possibilities were different. For more on the Warren side of things–and a better explanation of the tribal membership process (which, to clarify, is different than getting a CDIB, but also related to it, as, in many cases, it's required to then assert membership in a particular tribe), see http://americanindiansinchildrensliterature.blogs…. Well, I read your link and I'm not sure I buy a word of it. So this person is "enrolled." So what? That whole system is federally created, isn't it? Sure, tribes have a moral right to determine who gets to be a member… but that doesn't mean I have to believe in their process. I've seen stories of tribes kicking people out so that they can get more money — well, why would I pick a side? I wasn't there back then, there's no real way to know any of it… unless you're going to test DNA… and I find this woman's attitude highly problematic. To be clear… members of X tribe get to say who's in and who's out. And I get to not care. Just as background, I have NA blood too. From a [North] American tribe [geography, not my strong suit…], and I have no idea which one (so there!) Do I defer to people who are "enrolled?" Not really. Maybe I should, but I don't. And you don't want to get me started on "sovereignty" and land use in CA. Yeah. Best not to get into that. You know I was in a bad mood when I wrote that. ^^ I probably sound pretty unsympathetic, which on the larger issues I don't think I am … but when people use their status to beat up on other people they don't even know, I don't like to see that. This is starting to remind me of the Dolezal thing. Lots of fur was flying then too. Mind you, this "cultural appropriation" thing is also interesting. I read the Flaming whosit link. The band leader sounds like enough of a jerk that the guy may be better off. It reminded me though of that Yale thing. Which reminded me of a recent local college brouhaha, where some students actually went so far as to barricade a college president in his car for 2 hours. After which, *he* apologized for having offended them. I think they should have been at least suspended!! There is some very weird stuff going on. Some people seem to think that getting their feelings hurt is some kind of blank check. Wt foxtrot? Even without the "intentional campaign to destroy Native American identity and culture", identity with ethnicities gets strange fast. My patrilineal great-great-grandfather was Jewish–not sure how observant, but his wife was Jewish, and my great-grandfather had a "registered in the Synagogue at Vienna" birth certificate. None of my other ancestors was Jewish to my knowledge; more of them were German than anything else, and I look like the German side of my ancestry. But I have a Jewish name. And as a further complication…traditional Judaism resolves "Who is Jewish" through the maternal line only. So, yeah, things can get strange. Was it against the law or was it due to restrictive covenants written into the title/deeds or property of houses there that Jews could neither rent nor buy? A subtle distinction, perhaps, but if the former, that would be news to me and as (full-fledged, 3rd generation non-observant, secular) MOTM, I would be curious to learn that such things existed. I really don't know. I think that the definition of "Jewish" was legal, but I don't know whether Bronxville had zoning codes (law) or restrictive covenenants. Google answers is always dicey, but, one data point anyway. BUT other sources do not agree. So I don't know. Sorry, this was useless. Yep. So, for example, my family is non-jewish with respect to Jews (and also practically so, with various flavors of christianity and agnosticism) but jewish with respect to 1933-1945 and 1990-present germany.